A 1929 Duesenberg Model J “Disappearing Top” Convertible Coupe by Murphy for charity is the leading entry for RM Sotheby’s Motor City sale in July 2016 in Plymouth, Michigan. This is one of the most driven Duesenbergs and proceeds from car’s sale will benefit Hillsdale College. The estimate is $1,250,000 to $1,650,000. RM Sotheby’s 22nd annual Motor City sale will be held on July 30, 2016, at the Inn at St. John’s in Plymouth, Michigan. It is the official auction of the Concours d’Elegance of America at St. John’s and will feature around 80 blue-chip motor cars. The Motor City classic car auction is traditionally RM Sotheby’s first summer season auction and a prelude to the important Monterey classic car week in mid-August. The star entry for the 2016 RM Sotheby’s Motor City auction is a 1929 Duesenberg Model J “Disappearing Top” Convertible Coupe by Murphy. The car will be sold to benefit Hillsdale College, a top-ranked, non-profit, classical liberal arts college in Hillsdale, Michigan. The rare Duesenberg Model J “Disappearing Top” Convertible Coupe, engine no. J-119, is one of just a handful of similar, yet completely custom cars, individually built for their original owners. Their exclusive status and spectacular lines has made them the most iconic body style on the Model J chassis. The featured Duesenberg is offered complete with its original engine and dealer-installed Murphy “Disappearing Top” Convertible Coupe body, and has enjoyed enthusiast ownership throughout its life. Actively used and enjoyed by each of its caretakers, J-119 passed through the renowned collections of Melvin Clemans and Gifford Oborne, before eventually landing with Eric Bardeen of Florida. A member of the Auburn Cord Duesenberg Club since its earliest days, Mr. Bardeen has an incredible passion for the Duesenberg marque, and is known for using his Model J as it was intended—on the road! In his ownership, J-119 became one of the most driven Duesenbergs of modern times, a title earned via a roundtrip highway tour from the Sunshine State to Auburn, Indiana for the 2010 ACD Club Reunion. 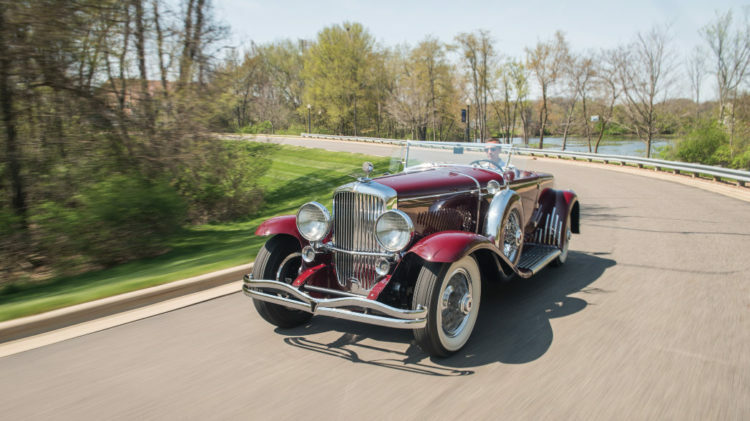 Mr. Bardeen, the Duesenberg’s owner of the last quarter century, is a longtime supporter of Michigan’s Hillsdale College, and generously offered J-119 to assist with the College’s fundraising efforts. It comes to auction in July following a cosmetic freshening and a recent comprehensive servicing by Duesenberg expert, Brian Joseph. Estimated to fetch between $1,250,000 and $1,650,000, all proceeds from its sale will benefit Hillsdale College. a noted and award-winning 1930 Cord L-29 Cabriolet, serial no. 2927648. With known history from new and its original chassis, engine, and body, the ACD Club Category One Certified Cord is offered from the estate of its third owner, beloved Kalamazoo businessman and enthusiast Wendell Gates II, who purchased the car as a junior high school student in 1946. Exhibited since 2013 in the CCCA Barn at the Gilmore Car Museum in Kalamazoo, Michigan, this legendary L-29 is offered for the first time in seven decades (Est. $150,000 – $200,000). A longstanding summer tradition for collectors, RM Sotheby’s Motor City sale has carved a reputation over the past two decades as one of the leading events honoring America’s rich automotive history. As the official auction of the renowned Concours d’Elegance of America at St. John’s, the sale will offer 80 blue-chip automobiles, led by important American classics, sports and muscle, with a selection of iconic and modern European sports cars complementing the domestic delegates.